GETTY IMAGESBlack students, and especially black girls, are disproportionately disciplined in school, according to the Department of Education. An incident this week in which a police officer was filmed roughly hurling a student to the ground is only one piece of a larger problem that disproportionately affects black students. A video recorded at Spring Valley High School in Columbia, South Carolina, shows a white officer removing a black, female student from a classroom in a manner that has been characterized by critics as “assault.” The footage has prompted outrage across the country and has led the FBI and Department of Justice to launch an investigation. The video is disturbing, showcasing an aggressive form of discipline that is, sadly, not isolated. Black students are far more likely to be punished and targeted by school authorities — including school-based police officers. 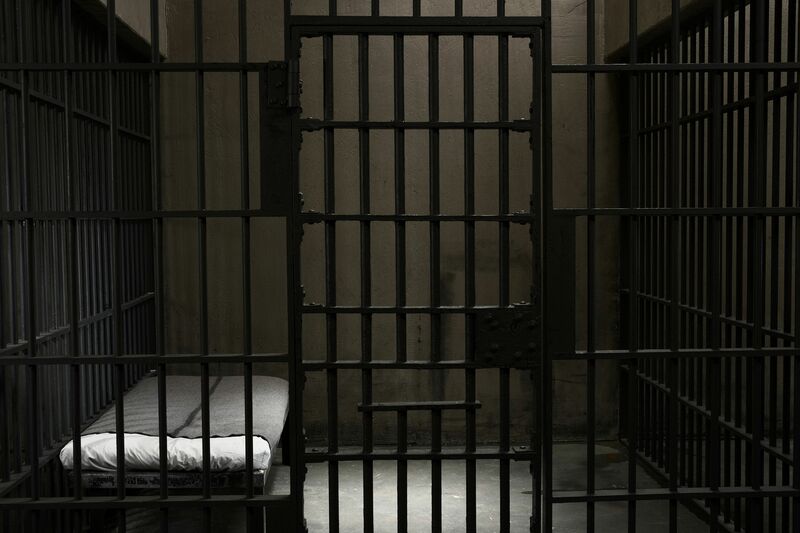 This unequal treatment is part of the school-to-prison pipeline phenomenon, in which discrimination pushes minority students out of school and into the criminal justice system. Black students are suspended and expelled from school three times more often than white students, according to 2011-2012 data from the U.S. Department of Education Office of Civil Rights. While 16 percent of black students were suspended from school during that period, only 5 percent of white students were — though they represented a much larger share of students enrolled in school overall. The map below, representing data from the UCLA Center for Civil Rights Remedies, shows where there was the greatest discrepancy between black and white students’ suspension rates. School discipline knows no age minimum — and neither does discrimination. Black students only represented 18 percent of U.S. children enrolled in preschool, but they accounted for nearly 50 percent of preschool students who received more than one out-of-school suspension, according to the 2011-2012 Education Department data. White children made up 43 percent of all preschool students, but just 26 percent of those who received more than one out-of-school suspension. 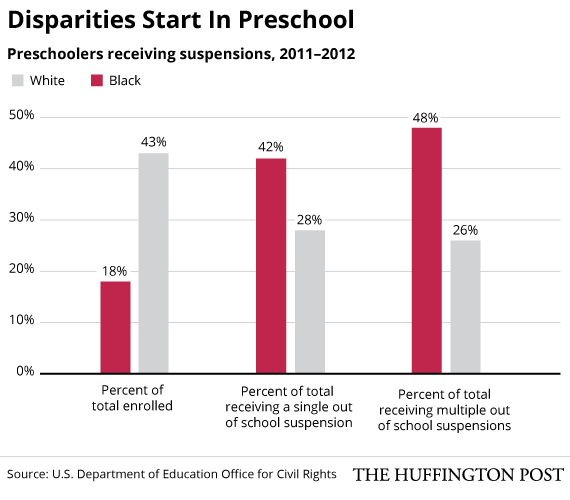 Tunette Powell, an author whose two young sons received multiple preschool suspensions, highlighted these statistics in a 2014 essay in The Washington Post. After speaking with local mothers, Powell, who is black, found that white students were not being punished for the same behavior. “One after another, white mothers confessed the trouble their children had gotten into. Some of the behavior was similar to JJ’s; some was much worse. Most startling: None of their children had been suspended,” she wrote. Black girls are doubly affected by discrimination — in the form of both racism and sexism. While black boys were suspended from school three times more often than white boys during the 2011-2012 school year, black girls were suspended from school six times more often than white girls. Kimberlé Williams Crenshaw, the executive director of the African American Policy Forum and a professor at Columbia Law School, told The Huffington Post in February that she fears officials are doing more to address bias against minority males than minority females. DARRIN KLIMEK VIA GETTY IMAGESIn New York City, nearly half of black students need to walk through a metal detector to get to school every day, while only 14 percent of white students do. Not only are black students disproportionately subjected to school-related arrests (they represent 16 percent of enrolled students, but 31 percent of students arrested over something that happened at school), but they are also more likely to attend a school that looks and feels like a jail. In New York City, more than 90,000 students pass through a metal detector to get to school every day, according to a September WNYC analysis. These students are often black. Almost half of black students in New York City face a metal detector every day, compared to only 14 percent of white students. Students who get suspended from school multiple times by the end of 10th grade are overwhelmingly more likely to drop out of high school — and high school dropouts are significantly more likely to end up in the criminal justice system. “People think suspending kids out of school is free, but in fact, there are tremendous costs, because it increases one’s risk of dropping out of school and juvenile justice involvement,” Daniel Losen, the director of the Center for Civil Rights Remedies, told HuffPost in February.